Grant, we beseech thee, O Almighty God, that celebrating the festival of thy holy martyrs, Cosmas and Damianus, we may, by their intercession, be delivered from all impending evils. Through our Lord Jesus Christ, thy Son, who liveth and reigneth with thee, in the unity of the Holy Ghost, God, world without end. Amen. ‘Honour the physician for the need thou hast of him: for the Most High hath created him. For all healing is from God, and he shall receive gifts of the king. The skill of the physician shall lift up his head, and in the sight of great men he shall be praised. The Most High hath created medicines out of the earth, and a wise man will not abhor them. Was not bitter water made sweet with wood? The virtue of these things is come to the knowledge of men, and the Most High hath given knowledge to men, that He may be honoured in His wonders. By these he shall cure and shall allay their pains, and of these the apothecary shall make sweet confections, and shall make up ointments of health, and of his works there shall be no end. For the peace of God is over the face of the earth. My son, in thy sickness neglect not thyself, but pray to the Lord, and He shall heal thee. Turn away from sin and order thy hands aright, and cleanse thy heart from all offence. Give a sweet savour, and a memorial of fine flour, and make a fat offering, and then give place to the physician. For the Lord created him: and let him not depart from thee, for his works are necessary. For there is a time when thou must fall into their hands: and they shall beseech the Lord, that He would prosper what they give for ease and remedy, for their conversation.’ (Ecclus, xxxviii. 1-14) These words of the Wise Man are appropriate for this feast. 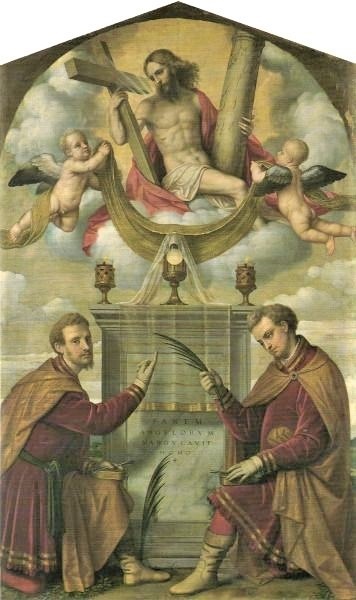 The Church obeying the inspired injunction, honours the medical profession in the persons of Cosmas and Damian, who not only, like many others, sanctified themselves in that career; but, far beyond all others, demonstrated to the world how grand a part the physician may play in Christian society. Cosmas and Damian had been Christians from their childhood. The study of Hippocrates and Galen developed their love of God, whose invisible perfections they admired reflected in the magnificences of creation, and especially in the human body His palace and His temple. To them, science was a hymn of praise to their Creator, and the exercise of their art a sacred ministry; they served God in His suffering members, and watched over His human sanctuary, to preserve it from injury or to repair its ruins. Such a life of religious charity was fittingly crowned by the perfect sacrifice of martyrdom. East and west vied with each other in paying homage to the Anargyres, as our saints were called on account of their receiving no fees for their services. Numerous churches were dedicated to them. The emperor Justinian embellished and fortified the obscure town of Cyrus out of reverence for their sacred relics there preserved; and about the same time, Pope Felix IV built a church in their honour in the Roman Forum, thus substituting the memory of the twin martyrs for that of the less happy brothers Romulus and Remus. Not long before this, St. Benedict had dedicated to Saints Cosmas and Damien his first monastery at Subiaco, now known as St. Scholastica’s. But Rome rendered the highest of all honours to the holy Arabian brethren, by placing their names, in preference to so many thousands of her own heroes, in the solemn litanies and on the sacred dyptichs of the Mass. In the middle ages the physicians and surgeons banded together into confraternities, whose object was the sanctification of the members by common prayer, charity towards the destitute, and the accomplishment of all the duties of their important vocation for the greater glory of God and the greater good of suffering humanity. The Society of Saints Luke, Cosmas, and Damian [was] undertaken in France the renewal of these happy traditions. The following is the Church’s account of the two brothers. The brothers Cosmas and Damian were Arabians of noble extraction, born in the town of Ægæ. They were physicians; and during the reign of Diocletian and Maximian, healed even incurable maladies by Christ’s assistance rather than by their knowledge of medicine. The prefect Lysias, being informed of their religion, ordered them to be brought before him, and questioned them on their faith and their manner of life. They openly declared that they were Christians, and that the Christian faith is necessary to salvation; whereupon Lysias commanded them to adore the gods, threatening them, if they refused, with torture and a cruel death. But as the prefect saw his threats were in vain: ‘Bind their hands and feet,’ he cried, ‘and torture them with the utmost cruelty.’ His commands were executed, but Cosmas and Damian remained firm. They were then thrown, chained as they were, into the sea, but came out safe and loosed from their bonds. The prefect attributing this to magical arts ordered them to prison. The next day, he commanded them to be led forth and thrown on a burning pile, but the flame refused to touch them. Finally, after several other cruel tortures, they were beheaded; and thus confessing Jesus Christ, they won the palm of martyrdom. Saints Cosmas and Damian were brothers, and born in Arabia, but studied the sciences in Syria, and became eminent for their skill in physic. Being Christians, and full of that holy temper of charity in which the spirit of our divine religion consists, they practised their profession with great application and wonderful success; but never took any gratification or fee. They lived at Ægæ or Egæa, in Cilicia, and were remarkable both for the love and respect which the people bore them on account of the good offices which they received from their charity, and for their zeal for the Christian faith, which they took every opportunity their profession gave them to propagate. When the persecution of Dioclesian began to rage, it was impossible for persons of so distinguished a character to lie concealed. They were therefore apprehended by the order of Lysias, governor of Cilicia, and after various torments were beheaded for the faith. Their bodies were carried into Syria, and buried at Cyrus. Theodoret, who was bishop of that city in the fifth century, mentions that their relics were then deposited in a church there, which bore their names. He calls them two illustrious champions, and valiant combatants for the faith of Jesus Christ. The Emperor Justinian, who began his reign in 527, out of a religious regard for the treasure of these precious relics, enlarged, embellished, and strongly fortified this city of Cyrus; and finding a ruinous church at Constantinople, built in honour of these martyrs, as is said, in the reign of Theodosius the Younger (who died in the middle of the fifth age), raised a stately edifice in its room, as a monument of his gratitude for the recovery of his health in a dangerous fit of sickness, through their intercession, as Procopius relates. To express his particular devotion to these saints, he built also another church under their names at Constantinople. Marcellinus, in his chronicle, and St. Gregory of Tours, relate several miracles performed by their intercession. Their relics were conveyed to Rome, where the holy Pope St. Felix, great-grandfather to St. Gregory the Great, built a church to their honour, in which these relics are kept with veneration to this day. These saints regarded it as a great happiness, that their profession offered them perpetual opportunities of affording comfort and relief to the most distressed part of their fellow creatures. By exerting our charity toward all in acts of benevolence and beneficence, according to our abilities; and in treating enemies and persecutors with meekness and good offices, we are to approve ourselves followers of Christ, animated with his spirit. In the imitation of the divine goodness, according to our abilities, at least in the temper of our mind, consists that Christian perfection, which, when founded in the motive of true charity, is the accomplishment of the law. Men engaged in professions instituted for the service of their neighbour, may sanctify their labour or industry, if actuated by the motive of charity towards others, even whilst they also have in view the justice which they owe to themselves and their family, of procuring an honest and necessary subsistence, which is itself often a strict obligation and no less noble a virtue, if it be founded in motives equally pure and perfect. Ss. Cosmas and Damian, pray for us.